He is a graduate from Kurukshetra University and did Post Graduate Diploma in Business Administration from IMT, Ghaziabad. 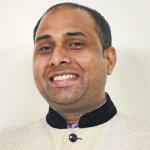 He is working with Centre for Civil Society since 2004 and has more than 13 years of experience in administrative functions including handling Office Management, Vendors, Server & IT support, Events Support and Database management. He also worked in Administration & IT sector at CUTS Institute for Regulation & Competition (CIRC), New Delhi.